I've inherited scores of ornaments from family, especially Mom. Christmas was her absolute favorite holiday. As I began to unpack everything over Thanksgiving, it became quickly obvious that our tree wasn't going to hold our extensive collection. Rather than pack away the excess of ornaments, I decided to make a wreath with them. I love the final result, but better yet I upcycled the wire base from a previous project that was looking a tattered and tired after months in the sun. 1. Prepare the wire frame. If you are upcycling from a previous project like myself, be sure to carefully remove all bits and pieces from the wire frame. 2. Wrap the frame with the garland. I tried more complicated configurations, but what works best is simply wrapping the frame with the garland. i didn't wrap it too tightly as the the tinsel is think and fills in the blank bits. Use some floral wire to tie down the ends of the garland if necessary. 3. Prepare the ornaments. Thread the loop at the top of each ornament with a foot of ribbon. Center the ornament on the ribbon and tie the ribbon into a knot. 4. Tie the ornaments to the wreath. Tie on an ornament using the ribbon and either knotting it again or tying it into a bow. Work around the wreath until it is filled in as desired. I tied on over 30 ornaments of all sizes and materials. As it is on my front door in full southern sun with no storm door, I only used glass, wood and metal ornaments. My favorite paper and cloth ornaments are inside. 5. Tie on the green ribbon. Thread the ribbon through the top of the wreath. Pull the ends of the ribbon until the are level with each other. Tie a knot at the top. 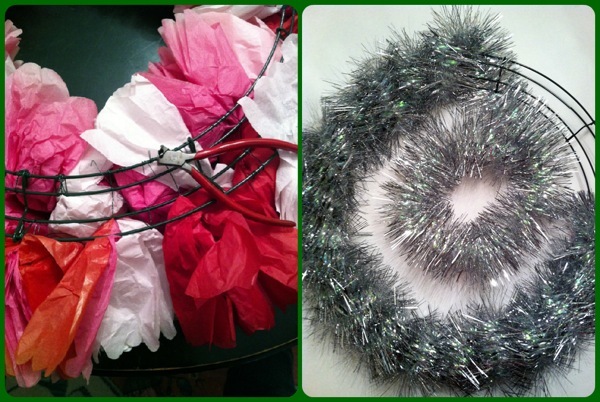 To more firmly hang the wreath from a nail on the front door, I cut 18" of floral wire to the wreath next to the ribbon. I twisted it onto a portion of the wire frame. I then took the other end, fold the top into a loop and twisted to close the loop.